Nan-men Market is arguably one of the best managed traditional market in Taipei. Most traditional markets have no organization whatsoever. Anyone can rent a stall and sell anything. You can buy shoes and skirts right next door to a pork butchershop. But in this setting you establish a relationship with the vendors. In supermarkets most items are mass produced and packaged, and the quality may not be as fresh. 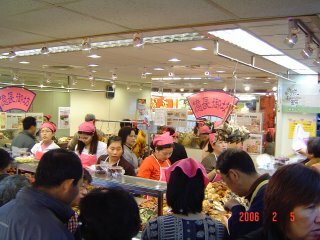 In Nan-men Market, produce and raw meat/poutry/seafood are exclusively sold in the basement, while the street level sells freshly prepared dishes, candies, dried goods, and dumplings, cakes, pastries, etc. Seafood is very fresh here. Live fish can be bought here. Clams are kept alive in shallow pans with flowing water. Peas just shelled from the pods can be easily found. No wonder I miss my mom's dishes -- anything made out of these excellent ingredients can't be bad. 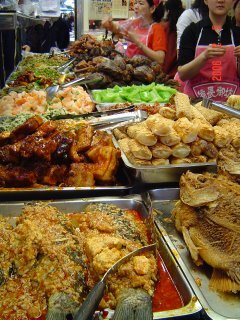 When I lived in Taiwan, every Sunday morning ritual was to go to Nan-men Market and buy freshly prepared dishes for Sunday lunch. Our destination is called Yi4-Chang2-Yu4-Fang1 (憶長御坊), now made extremely famous by all the media coverage and celebrity endorsements. We have been coming here for over 15 years. Even though I show my face there only fewer than once every year, the "aunties" still recognize me and would always pack us extra dishes for free. I love this place!